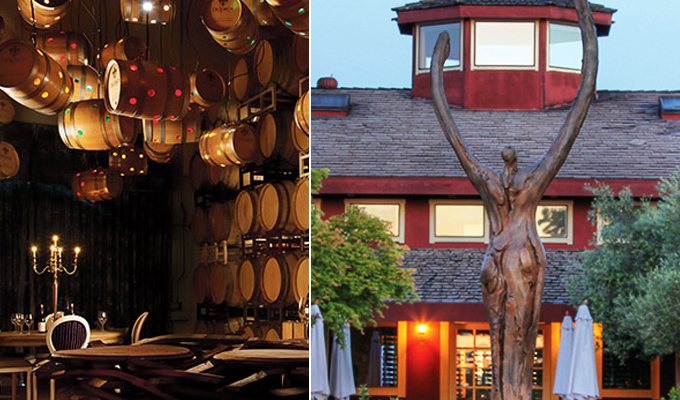 A trip to Sonoma isn’t complete without having tasted from the bounty of world-class wines grown here. Guerneville sits within the Russian River Valley, one of California’s most celebrated homes for Pinot Noir and Chardonnay. 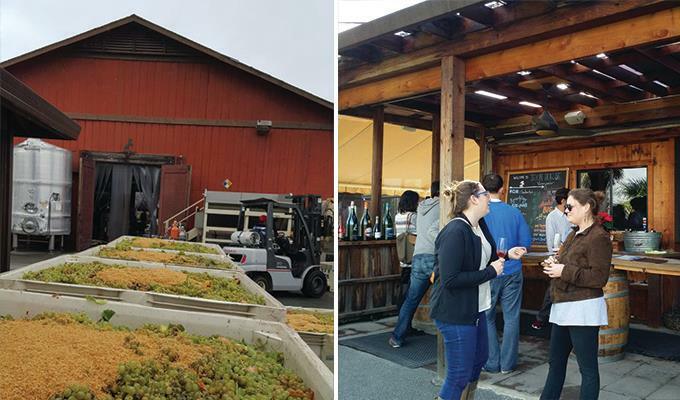 While few wineries lie within the city limits, some of the region’s best wineries are just a short drive outside Guerneville’s boundaries. Here are seven of our favorites to visit over a two-day trip. Whether or not you know the difference between sparkling wine and Champagne (hint: Champagne is a region in France and only sparkling wine from that region can be called “Champagne”) the method of transforming a still wine into a sparkling one is rich with history. Korbel Champagne Cellars, which was founded in 1882, is one of America’s most historic sparkling houses. Treat yourself to a free tour of their cellars and museum, offered hourly beginning at 11 a.m., with the last group leaving at 3 p.m. Each visit finishes with a tasting from Korbel’s iconic portfolio that’ll have you and strangers toasting away like it’s New Year’s Eve. Make sure to check out their garden—it’s planted with over 250 varieties of roses. Korbel Champagne Cellars lies right outside Guerneville. Continue east through downtown on River Road. After approximately 3 miles, Korbel will be on the left. Merry Edwards, a recent Vintners’ Hall of Fame inductee, is one of California’s pioneering female winemakers, and today she remains one of the most revered producers of Pinot Noir in the state. She founded her own winery in 1997, planting her first vines the following year. The homey tasting room sits in the middle of their Coopersmith vineyard, so stop by and learn from some fantastic educators just what goes into making world-class Pinot. While Sonoma is better known for Chardonnay, Merry Edwards produces one of the most celebrated Sauvignon Blancs in America—don’t leave without tasting it if you’re a fan of whites. Continue east from Korbel Champagne Cellars on River Road for 4.6 miles. Turn right onto Mirabel Road, and after 1.4 miles turn left onto Front St. Continue onto Grevenstein Highway and Merry Edwards will be on the left after about 3 miles. At DeLoach Vineyards, all wines are produced from organic and biodynamic grapes, and you can learn all about what goes into these viticultural practices during one of the many wine tasting experiences. Offerings include vineyard tours, guided tastings with wine experts, and blending experiences, allowing the opportunity to play winemaker for the day. The tasting room offers a refined country vibe, but the barrel cellar is wonderfully eccentric—make sure to get a peek of the colorful barrel light fixtures. DeLoach Vineyards is one of a handful of wineries with a picnic area. Pack your own lunch and purchase a bottle of wine to enjoy with it. From Merry Edwards , make a right back onto West Gravenstein Hwy. North. In less than a quarter mile, make a right turn onto Frei Road. At the end of the road, turn right onto Guerneville Road. After 1.6 miles, turn left onto Olivet Road. DeLoach will be your left after about a half mile. Gary Farrell Vineyards & Winery sources grapes for their Pinot Noirs and Chardonnays from some of the most famous vineyard sites in Sonoma and around California, including Gap’s Crown, Bien Nacido, and Olivet Lane. 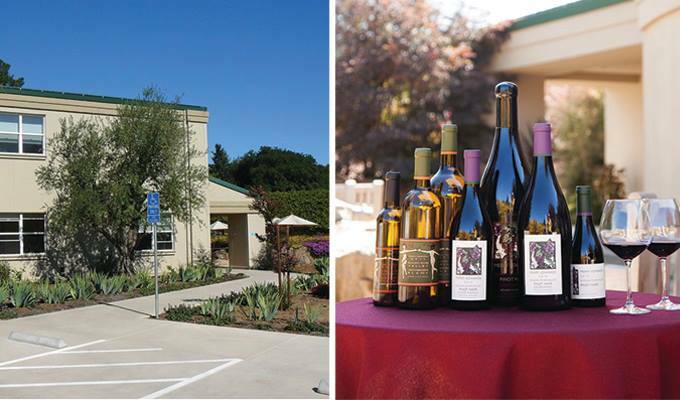 Their tasting room features a stunning patio overlooking Russian River Valley’s rolling hills. 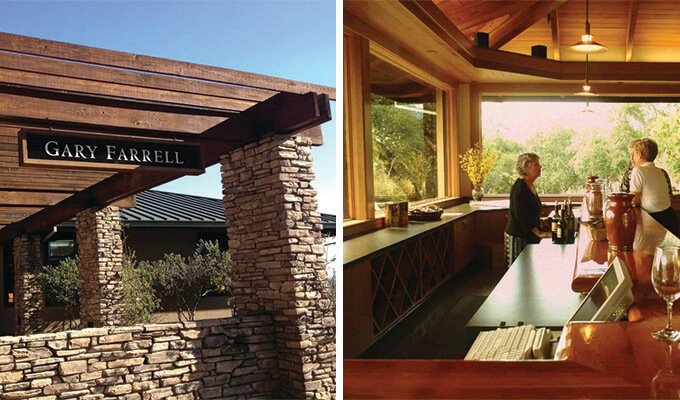 Gary Farrell Vineyards & Winery is famous for its single vineyard wines. Reserve their “Sense of Place” tasting and learn what makes each vineyard, and subsequently each single-vineyard wine, unique. Continue east through downtown Guerneville on River Road for approximately 5 miles. Make a slight left onto Westside Road, and Gary Farrell will be on right after about 2 miles. 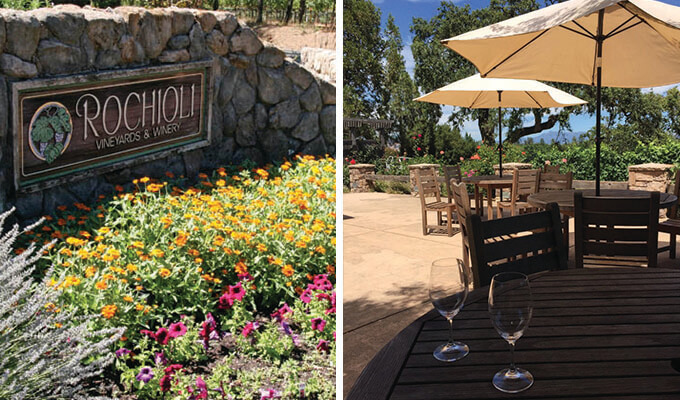 The Rochioli family provides a refined, casual Russian River Valley experience—after all, they’ve been in the business since 1959 and are one of the most established growers in the region. Best known for their Pinot Noir, they also own some of the oldest Sauvignon Blanc vines in California—don’t leave for home without sampling this complex, full-bodied variety. Make sure to ask about their Valdiguié. Californians once falsely believed this relatively obscure grape from France’s Languedoc-Rousillon region to be Gamay, the signature grape of Beaujolais. From Gary Farrell Vineyards & Winery turn left back onto Westside Road. After about 5 miles, Rochioli will be on your right. 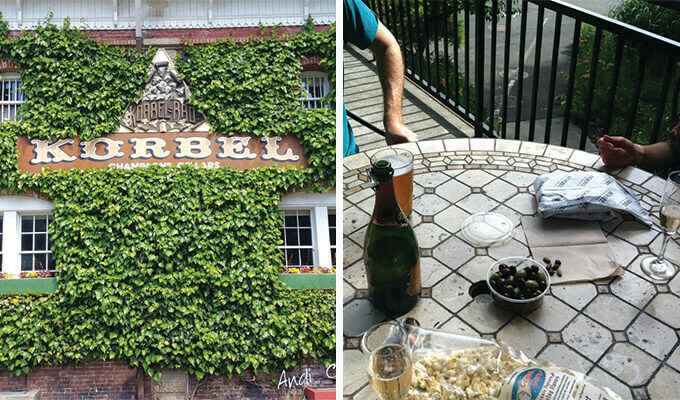 Finish off your trip to Guerneville the way you began, with California bubbles. Iron Horse produces some of the most outstanding sparkling wines in the country, and is frequently served at the White House. The winery is open for tours, or for a more casual tasting of five of their sparkling and still wines. Winemaker David Munksgard drives a truck tour through the vineyards and leads an exclusive tasting each Monday at 10 a.m. Make sure to book this one-of-a-kind experience in advance—this intimate experience is capped at only four people. From Rochioli Vineyards and Winery, head south on Westside Road for 5 miles (it will turn into Wohler). Turn right onto River Road and take the first left onto Trenton Road. Turn left again onto Covey Road and the left again onto CA 116 East. After a mile, turn right onto Ross Station Road and Iron Horse will be on the left.